I went to see Solo this past weekend. I was kind of dreading it, actually. Every new installment of this beloved franchise since Return of the Jedi has been a major disappointment (with the notable exception of Rogue One), and I had heard rumors that Solo was not doing super well at the box office. People aren’t going to see this one. The movie-makers think that it’s “Star Wars Fatigue” – and in a way, they are right, but I don’t believe it’s the kind of fatigue they think it is. Star Wars fans LOVE Star Wars. But we’re also a bit put-out with the writers and directors messing with our favorite story (and messing it UP). One of the biggest problems with the new movies, in my opinion, is that the writers and directors underestimated something extremely important: they underestimated the fans’ LOVE of Han Solo. And they overestimated the fans’ love of Princess Leia. (No offense intended to Carrie Fischer, I love Leia, I do, but nowhere nearly as much as I love Han and Luke). Nothing demonstrates this better than the two movies in the new trilogy. People aren’t staying away from Solo because they’re tired of Star Wars. They’re staying away from Solo because they’re upset with the new writers. JJ Abrams did the unthinkable. He killed Han Solo. And he didn’t even do it in a grand, awesome, quippy, SAVE THE GALAXY sort of way. No, it was a stupid, pointless death, designed to give the story an emotional “oomph” but really just made most of the faithful fans angry. Solo is reaping the culmination of that anger. Han was our favorite, and they killed him. And now they want us to embrace this new what’s-his-name-actor PRETENDING to be Harrison Ford’s Han Solo? Can I get a resounding, “No, thanks!”? And that’s really too bad. Because Solo is a great movie. As you might have guessed from the trailers… in this movie you get to see a lot of Han Solo’s back-story. Including his first meeting with Chewbacca, Lando, and the Millenium Falcon. All three of these stories were clever and entertaining. They weren’t exactly as I had pictured them, but they were well-done and fun and managed to capture that Star Wars essence that is difficult to define. Han Solo - No. Alden Ehrenreich is no young Harrison Ford. But I knew that going in. His voice is different, his mannerisms are different, and with the exception of a few momentary frames, he looks nothing like Han Solo (except for the outfit). Also, he kind of felt too short. HOWEVER, all that aside, I thought he did a pretty good job portraying a young Han Solo. He’s cocky, brash, and sometimes he’s as good as he thinks he is… and he did a good job being the totally reluctant hero. At the beginning of the movie, Han is a kid living on the streets of Corellia in a sort of Dodger/Fagin sort of Oliver Twist kind of scenario. I love Oliver Twist, so I enjoyed this parallel. Han and his girlfriend (whose name is apparently spelled like this: Qi’ra – pronounced “Kira”) dream of escaping to a better life. Han dreams of being a pilot (not unlike another young Star Wars hero we know), and Qi’ra… well, I’m not sure what she dreams of, other than being free. I also loved that Han is not portrayed as a bumbling idiot who just sort of stumbles into things that work… yes, he can improvise when he needs to, but he also manages to plan things out ahead of time and pull them off fairly brilliantly! Corellia – This is not the Corellia I was expecting… though I am willing to believe that not ALL of Corellia is a slum, as the idea of a planet-wide slum is a bit difficult to swallow (sometimes, sci-fi movie writers forget to think BIG enough), and because Han has always struck me as being proud of being Corellian (though that might just be what I’ve gleaned from the books, and not movie-canon). However, from what I saw of Corellia, it was different than a lot of other places I’ve seen in the Star Wars movies, and props to the writers for not making it a desert planet. The story – I would have liked to get to see Han at the Imperial Flight Academy. I was a little bummed I didn’t get that. But I enjoyed the story that they did show me. There was a little bit of a Wild West feel to it – which is appropriate, since Han is the closest thing to a cowboy this galaxy has. There is a pretty fun heist story running through the veins of this movie, which makes it a bit of a lower-stakes sort of Star Wars story, which was actually quite refreshing. There was no spherical laser canon of death to blow up, although there was some coverage of the Empire and its activities, as well as a passing reference to the beginnings of the Rebellion. Donald Glover – while he’s also not a young Billy Dee Williams by any stretch of the imagination… he did an excellent job portraying a very believable Lando Calrissian. I loved the tiny nods to the EU fans, in that Lando is a character who is constantly known for going into and out of retirement, always on the brink of “settling down and living the good life” but also ultimately incapable of actually doing so. I also loved getting to see the beginnings of Han and Lando’s frenemy-style relationship. Sabacc - Although they didn’t have digital cards and a randomizer (EU fans will understand), we haven’t gotten to see sabacc played in a Star Wars movie before, and it was fun to finally see that happen. Han and Chewie – The way that they meet is not what I had pictured, but no less fun and entertaining for that. The humor. There is a lot of humor in this movie. Most of it comes from Han’s dialogue, of course, but there are just moments that were truly, laugh-out-loud funny. The Millenium Falcon – I mean, she’s every bit as much of a character as anyone else in Star Wars, right? Honestly, watching Han Solo fall in love with the Millenium Falcon was quite possibly the absolute best part of this movie. I would not have minded at all another half hour of story in which he has to pilot her through all sorts of difficult terrain… but maybe that’s just me. Anyway, what was in the movie was fantastic. The visuals. Some people have complained about the visuals… but I really liked the way this movie looked. There was an element of soft-focus to it, a kind of haziness that made me feel like I was watching something that would fit in well with the original trilogy. There was none of the ridiculous cartoony bright colors of the prequel trilogy, nor the pristine, sharp focus of the new trilogy. It was kind of its own thing, and I liked that. The open-ended nature of the end of the movie. It is not a cliff-hanger, but the movie leaves a lot open for TONS of stories about Han Solo between the end of this story and the beginning of Episode 4. My GREAT HOPE is that they will go ahead and write those stories, because there is no way that I could ever believe that the Han Solo at the end of this movie could possibly be the Han Solo at the beginning of A New Hope just a few days later. There have to be YEARS of stories between the two… and I think there could be some great ones. The only really big negative I have with this movie is that in spite of all the fun and humor and nostalgia… I did feel that the movie was ultimately lacking in what a friend called “its emotional trajectory.” I never really felt like I got to a point where I was emotionally invested in the characters (there may have been a moment or two) but ultimately, I never got too bent out of shape over any of them, even when emotional things happened. I wanted to, but none of them succeeded in grabbing my heart and not letting go. I also felt like the soundtrack was a little bit lacking. Which is weird, for a Star Wars movie. OKAY…. THAT IS ALL I CAN DO WITHOUT SPOILERS. My summary: GO SEE THIS ONE! It’s fun, fast-paced, and entertaining. It’s got a fun story, a lot of humor, and plenty of nostalgia without completely ripping off the plot of any other Star Wars movies (here’s looking at you, The Force Awakens). If you read any further, there will be spoilers. The second Sabacc game! I loved the way that the second game played out – and proved that Han is every bit as awesome as we already knew he was. For most of the movie, I thought Han was just going to find out that Lando cheated and claim his winnings that way. I did not see a second game coming, and I LOVED it. I really liked the nod back to ROTJ that they did with Han and Chewie’s first meeting. I would have liked an actual reference to the “life debt” aspect of their relationship, but that is a minor nitpick. There was quite a lot that I enjoyed about this movie. There were two mostly minor things that I did not like about this movie, and I just have to mention them here. I’m sorry, but the Empire does not get to name Han Solo. This part of the movie didn’t even make any sense and seemed a bit like a plot hole, because later in the movie, Han talks about his father and how he used to build Corellian ships… if he knew his father, how come he doesn’t know his last name? I know that the prevailing theory is that Han is part of a “peasant” class and thus has no last name, but that seems like a bit of a stretch, since we haven’t run into this particular issue with any other human characters before. Anyway, I prefer the EU version of this. However, this was a minor nit-pick. The big bad villain reveal at the end of the movie. Okay. This kind of goes in the pro/con list, because on the one hand, I’ve watched both cartoon series (Star Wars: The Clone Wars and Star Wars: Rebels) and so it wasn’t a huge shock to me that Darth Maul is still alive and kicking (if a bit mechanically, haha) but I spent the ENTIRE MOVIE thinking that they were going to propel Prince Xizor of the Black Sun into the canon (Black Sun is already part of the canon, as it shows up in Star Wars: The Clone Wars cartoon) and have HIM be the big bad behind everything. When I told my husband that afterwards, at first he didn’t agree with me, but then as we talked he changed his mind and was able to clarify why that move would have turned a movie that basically was a ground-rule double into a grand slam. It would have introduced a new, awesome villain that they could have explored. It would have intrigued those who haven’t read the books, because it would have been something new. It would have appeased the EU fans who love the books and are still a bit put-out that they have been relegated to “legends” and treated like second-class citizens. And it would have provided an even better hook for new movies. Darth Maul… makes sense. He’s like a cockroach… he manages to survive EVERYTHING (and he is the main reason I refuse to believe Han Solo is dead, because basically he was wounded less severely than Darth Maul, and everything that falls down a shaft in the Star Wars universe comes back just fine, and doesn’t even always need an explanation). But still. Prince Xizor would have been EPIC. Haven’t seen this one and I’m not sure I will. My daughter saw it and didn’t have many good things to say about it. She said it didn’t really feel like a Star Wars movie without light sabers and Jedi or any high stakes. And she didn’t appreciate the kissing scenes. Though I generally liked Rogue One, it didn’t feel much like a Star Wars movie until the end. And I think that’s kind of the vibe I’m getting about this one. A good movie on its own? Maybe. But a good Star Wars movie? That’s what I’m skeptical about. I’m not really that interesting in fleshing out Han’s origin story. I’m interested in the main story, the Jedi/Sith conflict, the grand Rebellion/Empire struggle (another reason the new movies disappoint is that they fail to do a good job with either of these). I do think that the lingering aftertaste of Episodes VII and VIII factor in to my lack of interest in this one. What the people making these new movies do not realize is that Han and Luke were heroes. They were the equivalent of Batman and Superman to the DC Universe. You can’t just kill them off without ripping the heart out of your story. Could the writers have conceivably written meaningful deaths for them? Maybe. But they didn’t even attempt that. Thanks for your review. I’ll probably watch it on DVD at some point, but sadly this may be the first Star Wars movie I do not see in the theaters. As a reader of the books, I don’t mind if there aren’t the huge high stakes or lightsaber duels in every story. Especially in Han’s story, as it makes sense that he didn’t come across many Jedi until Obi Wan and Luke given the things he says in Ep. IV and the things that happen in Ep. III. I kind of like seeing some aspects of the Star Wars universe where there are “regular people” in extraordinary circumstances. Han Solo has always been the “Batman” of the Star Wars universe, and I liked getting to see more of his story. Particularly since the Han Solo trilogy by A.C. Crispin is up there in my “favorite Star Wars books of all time” category. And while I am still bummed that those books will not be made into movies… I was content with the story they came up with and told in this movie. It doesn’t erase the books, which are still a great story, and I can read them whenever I want. I might just go do that. I totally agree that the movie creators do not understand that Luke and Han were heroes. Even George Lucas absolutely believed that the Star Wars story was about Anakin… I read a quote by him that one of the reasons he didn’t read the books or have any interest in writing further stories was that he just couldn’t even think of any stories that could be written after ROTJ… because Anakin’s story-arc completes there, and for him, Anakin/Darth Vader was the MC, there was no story after Anakin died… while the FANS know that Han, Luke, and Leia were the MCs. And therein lies the major disconnect between the writers and the fans in every SW movie since Ep. VI. Personally, and this could be a whole blog post on its own… I think that the biggest way the writers of the new trilogy messed up was by not setting it farther into the future. They should have set it a century or so after the end of ROTJ and not brought back any of the original cast. Hm. Maybe I should write a blog post on that. We three went to see it yesterday after granddaughter R’s ballet recital. I found myself laughing quite a few times (because I was genuinely amused) by Han . . . and how Lando never did get the pronunciation of his name correct, even from the very beginning! And I also found it easy to imagine this actor as a young Harrison Ford. I’ve not read one SW book and am not a “true blue” SW fan, but I like this one. However, I liked reading your review more than watching the movie! Aww, well, thanks! *grin* happy to entertain. I also enjoyed how they highlighted Lando’s incorrect pronunciation of Han’s name. That was classic! And Han was hilarious. 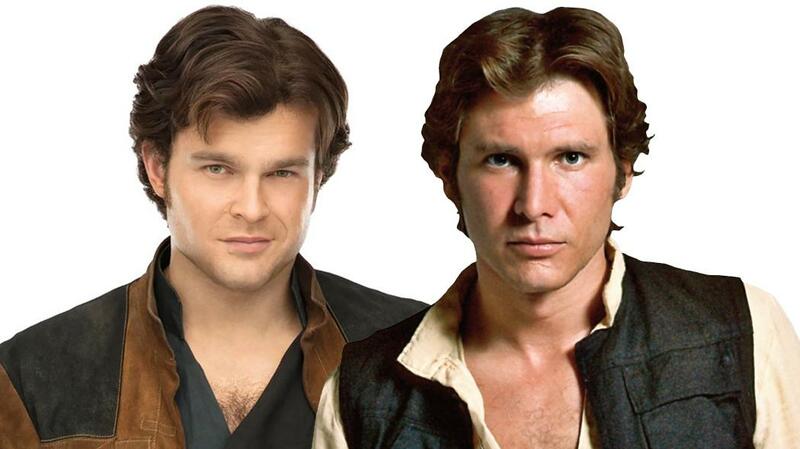 And, I decided to go see if there were any side-by-side comparisons of Harrison’s original Han vs. Alden’s… and I might have to take back my “they look nothing alike” statement…. Enjoyed your review. Very well written, and I agree with virtually every word! Thank you!!! I’m glad you enjoyed it. Thanks for commenting!